Ada Lovelace (played by Helen Hass) attempts to command the attention of Charles Babbage (Zach Crowle) as he obsesses over his Analytical Engine. This story includes videos below. Women are making exciting and impactful contributions to the world through computer science – and they have been doing so since the earliest computing machines were imagined. That was the message that inspired hundreds of attendees at a creative and engaging event in Stamps Auditorium on the evening of November 16. Prof. Jenna Wiens talks about data science and its powerful role in containing the spread of infectious disease. 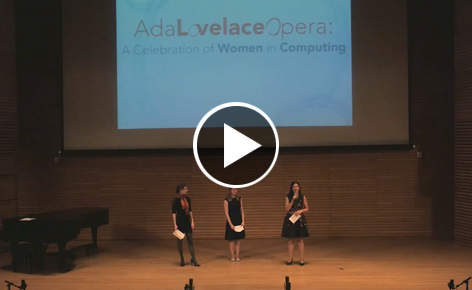 That event – the Ada Lovelace Opera – was a celebration of women in computing. Organized by Girls Encoded and co-directed by Prof. Rada Mihalcea, CSE graduate student Laura Wendlandt, and School of Music, Theater & Dance graduate student Helen Hass, the event featured computer science talks and an opera performance. The evening began with eight TED-style lightning talks by female faculty and students at UM who are engaged in cutting-edge computing research. The talks were followed by an opera on Ada Lovelace's establishment as the research partner of inventor Charles Babbage in the 1840s. The opera was performed by students in the School of Music, Theatre & Dance. Ada Lovelace is considered to be the world's first computer programmer, and she – more than Babbage – recognized that his Analytical Engine had applications beyond purely calculating. "Throughout the history of computer science, women have been remarkable contributors to the field," said Prof. Mihalcea. "I hope that their example will inspire more girls to become computer scientists and make a difference – in the field and beyond." During the event, Lovelace's story was told in vignettes by computer science students in the time between the lightning talks. After the talks, the opera imagined Lovelace's position as a woman in the 1840s navigating gender roles in order to establish her research relationship with Babbage. Prof. Reetuparna Das talked about building smarter and more efficient computer processors. "I was very pleased to see both families with young girls and students and faculty from across campus at the event," said Wendlandt. "This was a unique opportunity to reach out to people across the community and highlight many exciting developments women are making in computer science." Undergraduate Isabelle Wong described how crowdsourcing can remove barriers to collaborative computing. Prof. Emily Mower Provost describes how computers can monitor emotions to provide support for bipolar individuals. Several volunteers contributed toward making this event possible: Allison McDonald, Ritam Mehta, Betsy Wall, MeiXing Dong, Ana Cuza, Zoe Black, Aishwarya Reganti, and Veronica Perez-Rosas. 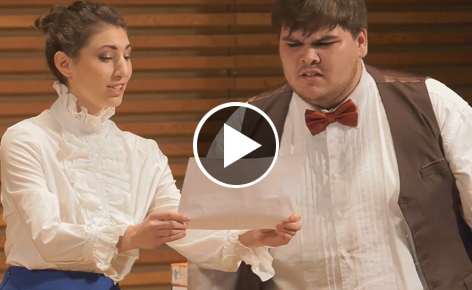 Ada Lovelace Opera performance of "Enchantress"